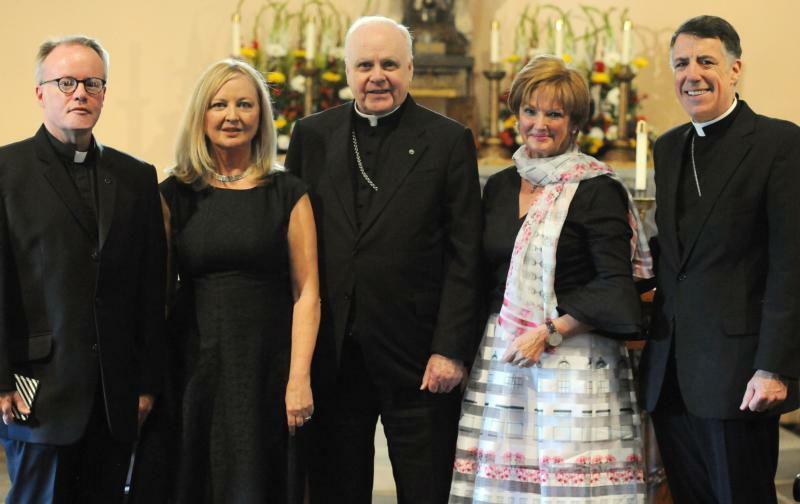 Cardinal O’Brien, who is grand master of the Equestrian Order of the Holy Sepulchre, gathered for a Mass with the Knights and Ladies of the Equestrian Order of the Holy Sepulchre for what was believed to be the first time for the diocese the grand master had gathered with members of the order. Resplendent in capes and berets, the Knights and Ladies led a procession for the Mass. The group included Lt. Vicki Downey, head of the order’s Eastern Lieutenancy, which has headquarters in New York, Bishop Checchio, retired Bishop Paul G. Bootkoski of Metuchen, St. Brigid pastor Msgr. Edward Puleo, and more than a dozen priests from around the diocese. In his homily, Cardinal O’Brien quoted from “The Road to Character,” a book by New York Times columnist David Brooks, to explain why people persisted in faith despite persecution and suffering. Christ passed the test of suffering, the cardinal reminded the congregation, and he can help us and those persecuted for the faith in other lands do the same. It is our responsibility to speak out and pray for them. The symposium following Mass was sponsored by the Anglosphere Society, a nonprofit membership organization formed in 2012 to promote the defense of religious freedom in the Judeo-Christian tradition. Shea and Father Kiely held their listeners spellbound as they cited facts and anecdotes on the torture, seizure of private property and destruction of many houses of worship affecting Christians worldwide. Shea reminded the assembly that these Christians could trace the roots of their faith to St. Thomas, but a population of 1.4 million Christians has dispersed and now fewer than 200,000 remain. The Anglosphere Society recommended using the acronym PRAY to help Christians worldwide. It stands for pray patiently but with perseverance; read about, research and respond to the needs of the persecuted; advocate and act so others become aware of the plight of persecuted Christians; and say yes by sharing time, talent and treasure on the Christians’ behalf. Leslie is a correspondent for The Catholic Spirit, newspaper of the Diocese of Metuchen.